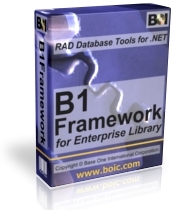 B1Framework (B1F) is a collection of reusable .NET components for building web, back office, and desktop database applications. The common data access layer and other core parts of B1F make it easier to write high performance, database-agnostic programs, and they provide a solid foundation for developing scalable commercial services. Based on Microsoft .NET Framework 4.0 and Enterprise Library 5.0 Application Blocks, B1Framework adds indispensable components for database access, logging, validation, caching, exception management, and security. The database access component presents a vendor neutral interface for building and executing commands in the .Net framework. It Illustrates how to use Enterprise Library's Data Access Application Blocks in a database independent way with SQL Server, Oracle, and DB2 databases. B1Framework's DataAccess namespace includes the standard functions for building and executing database commands, and discovering or caching parameters; but it also has classes for building compound SQL statements that handle automatic parameter creation, enabling multiple commands to be transmitted in a single database call. Compound commands can include calls to stored procedures and parameterized dynamic SQL, and they can include nested transactions, reducing the need to hold resources between calls to the database. Dynamic SQL and an in-memory cached database catalog add powerful capabilities for automatically generating Select, Insert, Delete, Merge commands that work against different databases. B1Framework interfaces make it easier to write high performance, multithreaded applications. The B1F Data Access layer includes a custom LINQ provider that uses .NET expression trees for efficient processing of complex joins, with C# compile-time error checking. The Paging class is a highly scalable means of querying and scrolling though extremely large result sets efficiently, without locking resources or resorting to full table scans and sorts. This class includes an interface that works directly with Entity Framework objects. B1Framework has a database setup utility for executing scripts to set up a new database or alter an existing one. It employs back-end specific command line tools that work with special DDL syntaxes and allow all types of objects to be created. Includes examples showing how to use B1Framework to perform multi-threaded, concurrent database operations across different back-end databases with a common code base. The Configuration component has classes for accessing the application settings, as well as supporting a concept of runtime replacement configuration parameters. Symmetric encryption using DES, RC2, Rijndael, TripleDES. Asymmetric encryption using RSA & DSA. Digital signature using asymmetric RSA and DSA. B1Framework is the next evolutionary step from the Base One Foundation Component Library (BFC), Base One's comprehensive suite of .NET tools built on a core of legacy COM, MFC, and Visual C++ programming. With over 15 years of continuous development and refinement, BFC has a record of proven performance in large-scale commercial applications. B1Framework takes BFC to the next level, retooled in pure C# to gain maximum advantage from the latest .NET technologies.